Join the Friends of the Library for their semi-annual meeting to discuss the upcoming book sale. All are welcome to join the Friends and help raise money for the library; dues are $5. 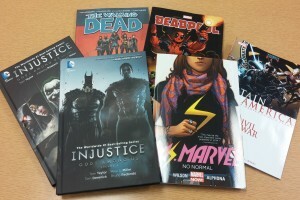 Graphic Novels Now at the Library! We are pleased to announce that there is now an assortment of graphic novels available at the Oglesby Public Library! Stop by the library today to pick one of these titles up! If you are interested in helping the library grow our collection of graphic novels by making a donation, we would be interested in any bound graphic novels or manga novels. Anything that is stapled at the spine (like a single-issue periodical comic) would probably not be a good fit for us!